We’ve lived in the Netherlands since 2009, and we believe it’s one of the best places in the world to bike tour. There are bicycle paths everywhere, a moderate climate and a surprisingly diverse landscape for such a small country. Over the space of a few days you can explore lakes, forests, beaches, sand dunes and so much more. 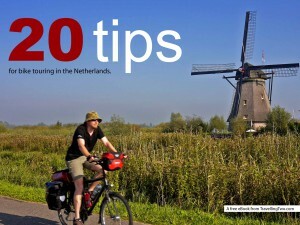 To celebrate the Netherlands, and to encourage you to come cycling here, we created this book of Dutch cycling tips.